By Ashutosh KS in Desktop. Updated on April 2, 2019 . 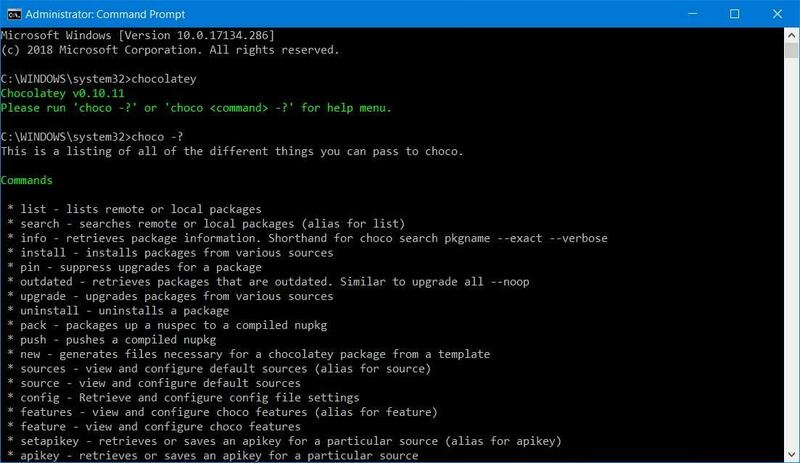 Chocolatey is a package manager for Windows 10 that offers most of the required features. Although it offers a graphical interface for accomplishing the basic tasks yet its command-line tool is more popular and powerful. However, for my readers’ convinience, I have designed this guide using Chocolatey GUI. 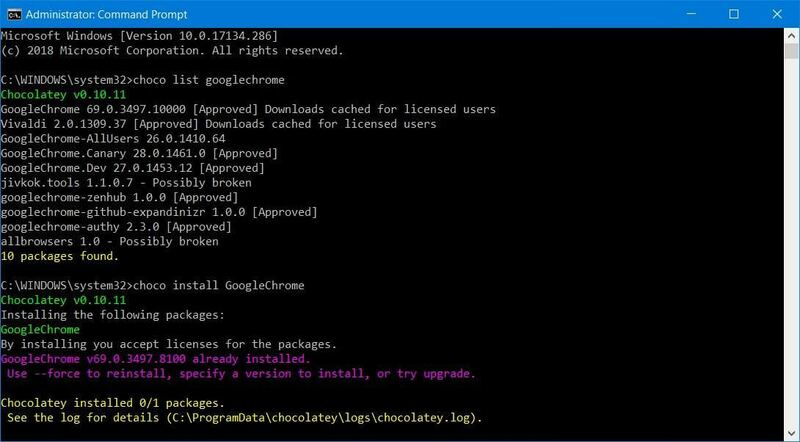 What I find most interesting is that Chocolatey is free like other popular package managers and supports thousands of software packages for Windows 10. It includes essential packages like Google Chrome, Mozilla Firefox, etc. 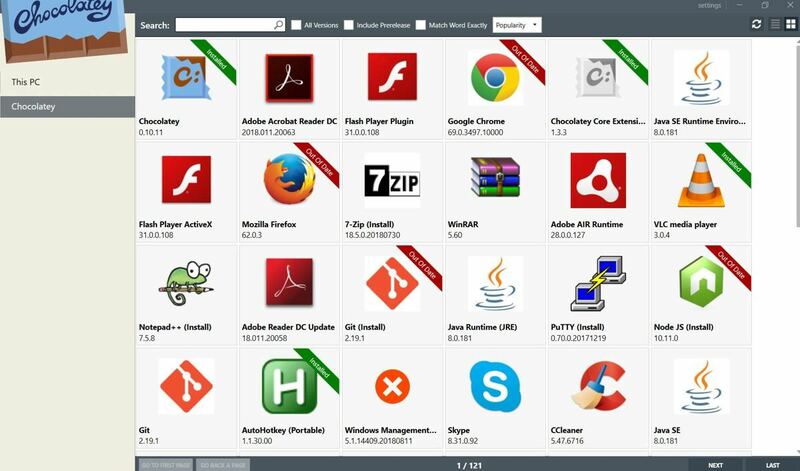 and other tools and utilities like Adobe Flash, CCleaner, VLC Media Player, etc. as well. Press Win + X and choose “Command Prompt (Admin)“. Copy and paste the following command in Command Prompt: @"%SystemRoot%\System32\WindowsPowerShell\v1.0\powershell.exe" -NoProfile -InputFormat None -ExecutionPolicy Bypass -Command "iex ((New-Object System.Net.WebClient).DownloadString('https://chocolatey.org/install.ps1'))" && SET "PATH=%PATH%;%ALLUSERSPROFILE%\chocolatey\bin"
After you have installed Chocolatey, you can test run the package manager by running chocolatey or choco -? in Command Prompt. If you see the below-like output, you are good, else there may be some problem. Press Win + X and select “Command Prompt (Admin)“. Run choco install chocolateygui in Command Prompt. If all things go okay, you will see above pic-like message. 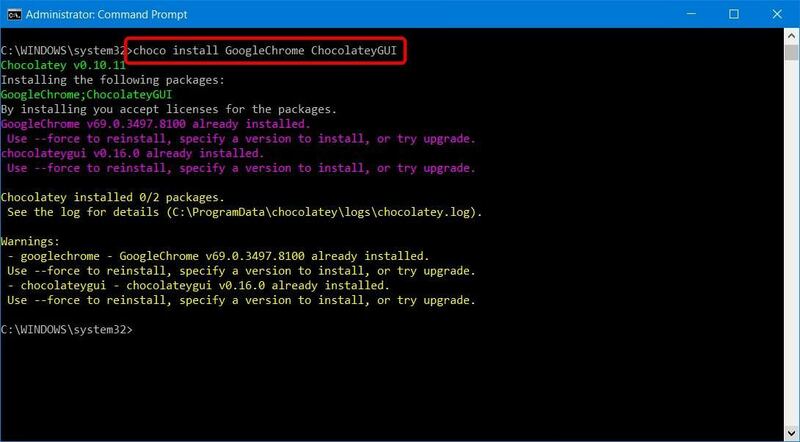 After you are finished installing Chocolatey and Chocolatey GUI, let’s see how you can install a package using these tools — one by one. If you are comfortable with Command Prompt, let’s do it, else you can skip to the next section. Please press Win + X and select “Command Prompt (Admin)“. I am telling to launch it with admin privileges because most packages will not install in the non-admin console, so let’s avoid possible issues. In the console, type choco list NAME (replace “NAME” with your search query). It will show you a list of packages matching your query; find the name of the required package. Then type choco install NAME (replace “NAME” with the exact name of the package), and Chocolatey will get and install it. If you are a beginner or do not feel comfortable with the console, please follow these steps. First of all, open Start menu, search for “Chocolatey GUI” and run it. 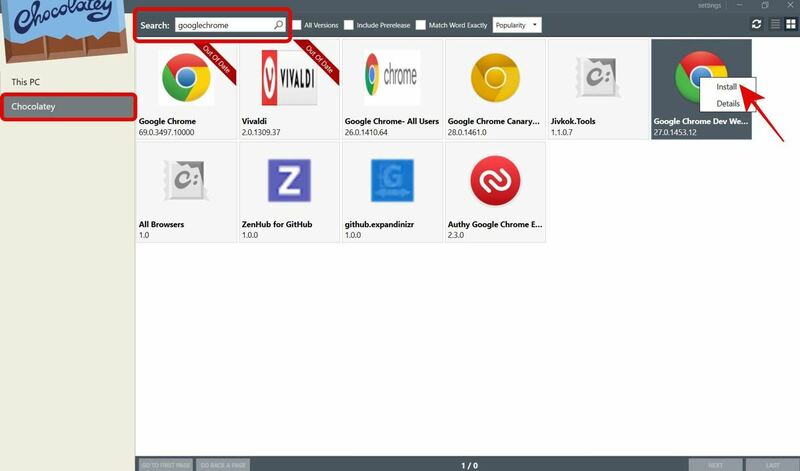 In its interface, click Chocolatey on the left, then type your search query in the text field named Search and hit Enter. It will try to find packages. After few moments, Chocolatey GUI will list the packages with similar names. You must find your package > right-click its thumbnail and select Install from the options. It will then download and install the package for you. Chocolatey GUI does not allow to install multiple packages in one go at this time, unfortunately. That means we need to rely on Chocolatey for this task. 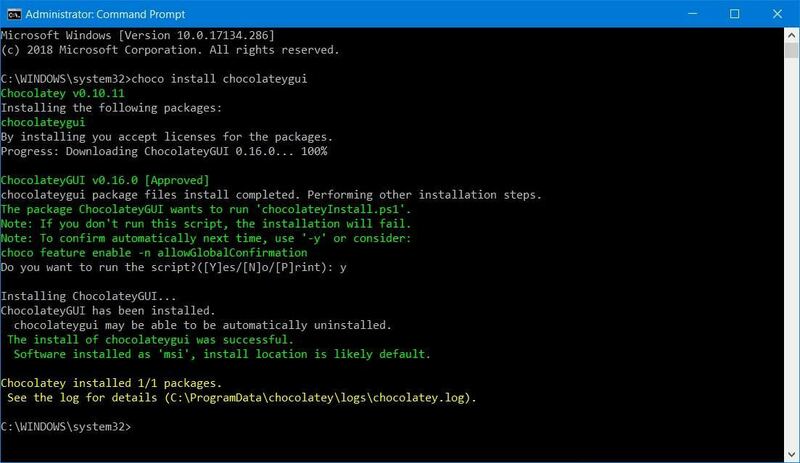 In the console (Command Prompt), type choco install NAME1 NAME2 to install multiple packages (replace “NAME1” with the name of the first package and so on). 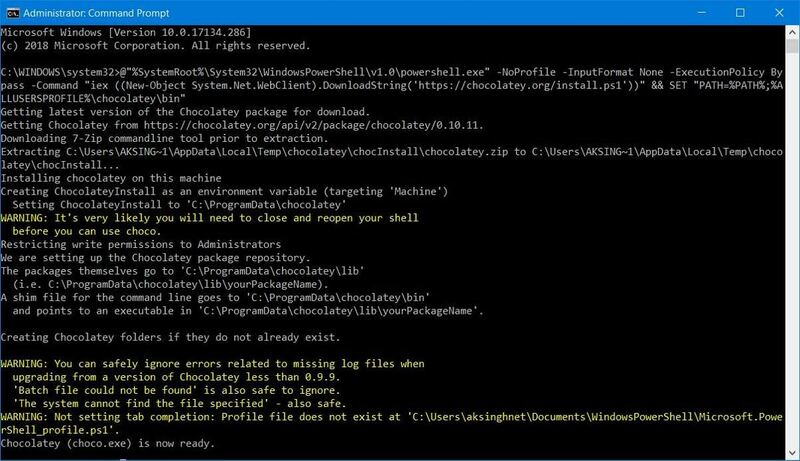 You can add as many packages as you require to install at a time, but do note to provide correct package names, else Chocolatey may show an error. Chocolatey GUI works well with updating packages in the same way it works well with installing packages. You can update packages in the single or batch mode per your preference. Let’s check out below how you can do it. In Chocolatey GUI, please click “This PC” on the left and you will see all the installed packages. You can right-click a package and select Update to update a package. Chocolatey will download its latest version and install it. Let’s see how to save time and update all of the installed packages in a system at once by using Chocolatey GUI. It’s as easy as clicking a few buttons. In Chocolatey GUI, in the left bar, click “This PC” to see all the installed packages. It may take some time to download the information about all the packages. When it stops showing the progress bar, you can click the “Update All” button to update all packages and leave rest all to Chocolatey GUI. That is all about installing and updating apps (or so-called packages) using Chocolatey and Chocolatey GUI. I hope it will help you to sleep more. How did you find this tutorial? Did it help you speed up the package management tasks? Please leave a comment below or write to me at @aksinghnet on Twitter.